About 9:30 this morning, some BT engineers arrived outside and with much noise and dust, started digging a hole outside our house. This was nothing to do with us. We’d not requested any work, but there you go. 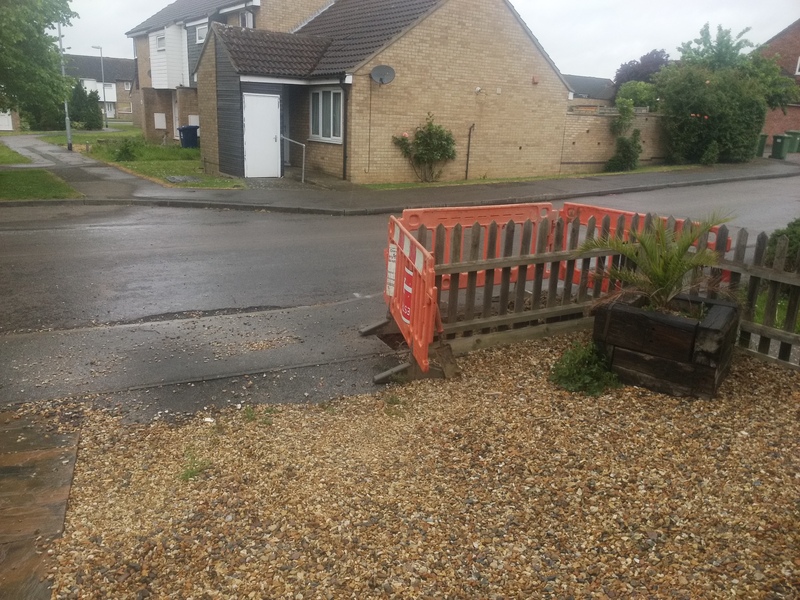 By 9:35, they’d gone, leaving the hole in the pavement, a big orange barrier, partially blocking our drive, and a spade in the garden. What they did not leave was a working internet connection, nor phone line. They’d not knocked on the door to say the net would be down, nor indeed had they made any attempt to communicate. Louise, from work raised a request. She’s had no response to explain what’s going on. At 13:30 when I wrote this, there has still been no sign of anyone to fill it in, nor any work, nor any functional phone service nor internet. Nor has Louise. My only connection to the outside world is through an expensive mobile connection. I can do nothing online, not even listen to music. To say I am annoyed would be an understatement. And now there are two BT Openreach vans outside, but they didn’t know there was any problem, apparently.